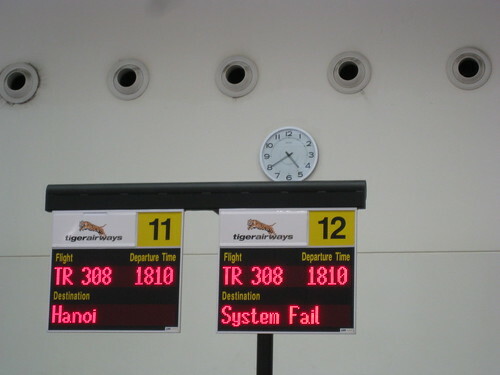 Despite the portentous signs at Changi Airport's Budget Terminal, we did get to Hanoi, safe and sound and on schedule. Before that, it was a mad day of rushing about. This was partly my fault because I procrastinated on various errands that I could've done weeks ago (changing money, photocopying, making extra keys). Exacerbating the situation was the fact that Ink chose the eve of my departure to develop a cornea ulcer. A cornea ulcer. It sounds worse than it looks (it looks like he has the pink-eye), but it entailed additional last-minute running around and pet care arrangements (thank you, Suzie and PetBuddy extraordinaire). One hour before I was due to leave for the airport, I was still sitting at my computer and wondering how many other things I needed to do. Somehow, I made it. I wasn't even late for my flight. In Hanoi, we've checked into a decent hotel that has an excellent as-good-as-at-home-if-not-better wireless network, had a drink with a fellow Lonely Planet writer and done a little laundry to boot. Plus there's a cool old Chinese house opposite the hotel that I can't wait to see in daylight. You brought your laundry to Hanoi and it was one of the first things you did after getting into the hotel? You really did procrastinate! LOL!